Tutti Fruiti Thread Pack of 10 skeins of Edmar Thread. 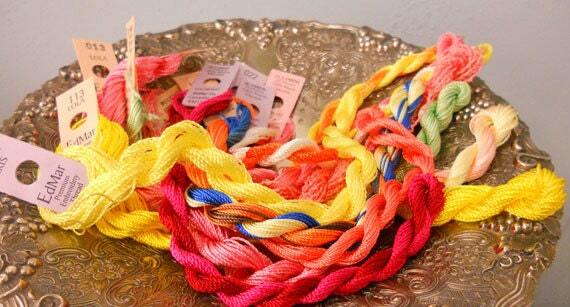 Tutti Fruiti contains 10 skeins of thread of Edmar Thread. This grouping is full of Tutti Fruiti colors including: lime, grapefruit, and lemon. This pack is made up of 10 skeins. There will be both solid and variegated threads in this pack. Edmar Threads are perfect for embroidery, Brazilian (3D) embroidery, crazy quilt embroidery, Hardanger, friendship bracelets, tieing quilts, wool applique, cross stitch, and needlepoint. These threads are 100% rayon and have a lovely shine to them and are incredibly soft. This listing is for 10 skeins similar to picture 1. If you have any questions please convo me.